Fireplaces, Chimneys, and Appliance Venting. Solid fuel includes coal or corn or cherry pits, but for most of us that means cord wood or pellets. The rule here is easy and clear. Multiple solid fuel prohibited. 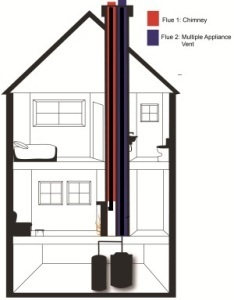 A solid-fuel-burning appliance or fireplace shall not connect to a chimney passageway venting another appliance. In other words, only one appliance per flue. Also this means, gas or oil appliances cannot be vented into a flue which also vents a solid fuel appliance. EVERY SOLID FUEL APPLIANCE GETS ITS OWN VENT! The fireplace has been blocked off. Gas fireplaces are usually factory-built systems. The manufacturer’s listing and instructions should mention attaching any other appliances to it. If venting two or more appliances on the same flue, you have to know the flue can handle it, as determined by the BTU input and other factors. Both or all appliances have to be on the same floor. So, no furnaces in the basement or room heaters on the second level of a dwelling. The connectors for the appliances have to be offset. They cannot come into the flue at the same height, and especially never directly across from each other. As a general rule, do not mix “natural draft” appliances and “fan assisted” appliances on the same flue. The rule may be more complicated than this, but if this is your case, be sure you refer to the manufacturer’s instructions. We realize a lot of this is technical “jargon”, and that maybe you don’t want to try and figure it all out yourself. So, we always recommend getting a certified professional out to your home BEFORE you add or change anything with your fireplace, chimney or venting issues.